Today’s Lunch was one for the books. When PR princess (really, that hair is to die for!) 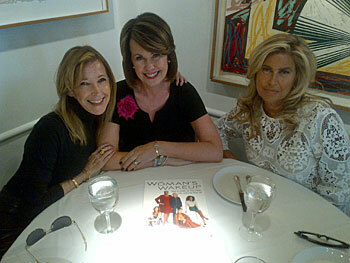 Maury Rogoff invited me to join her and her good friend Lois Joy Johnson at Michael’s, it occurred to me I hadn’t had the occasion to chat with Lois since she was the fashion editor at Ladies’ Home Journal and I was working in the PR department at Anne Klein. That was 27 years ago. We were both teenagers at the time. We got together today to talk about Lois’ new book, The Woman’s Wakeup: How to Shake Up Your Looks, Life and Love After 50 (Running Press) published earlier this year and her gig as columnist for AARP. I love it when my Lunch dates aren’t afraid to offer up more than a press release disguised as conversation. Lois did all that and more. Buckle up, it’s going to be a bumpy column.